The purpose of acquiring anatomical knowledge is to improve the skills of observation and presentation. A convenient way to achieve this goal is by combining learning from the literature with adopting some basic skills to investigate ones own body and to learn to mimic gestures by oneself. Most body positions require only in regard of a few anatomical constellations more detailed attention. But due to the astonishing variety of form and size of the elements involved, these aspects need to be well understood to achieve appropriated implementation. Many gesture offer various ways of muscular expression, and their display requests eventually considerable physical and mental skills. Many action-mimicking body positions are difficult to maintain or even impossible to display as static gestures, requiring considerable knowledge from part of the artist in their accurate presentation. Learning to mimic gestures by oneself presents also as a useful way to gain insight in the psychological aspect of their presentation. And finally it should be mentioned that implementing anatomical knowledge does not mean favoring a specific way of artistic expression, such as e.g. a realistic presentation. 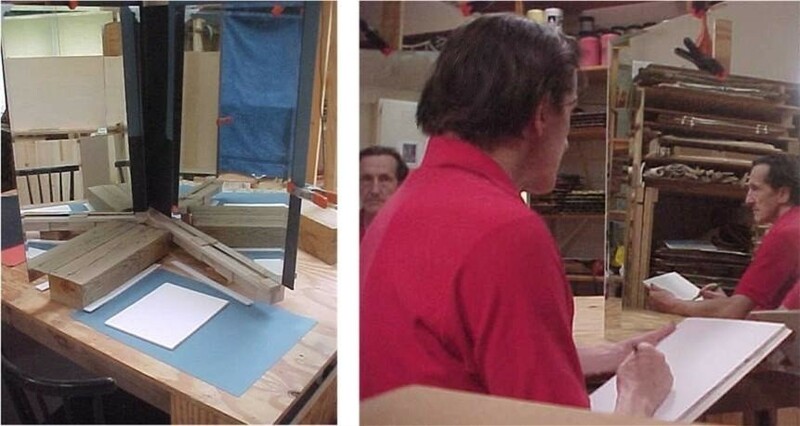 A suitable way to learn the anatomy and to draw the human body, is to study one’s own body in a setting such as a “two-mirror-arrangement“, observing in one mirror the mirror image of the body produced by the other. This type of installation provides excellent conditions for studying form and function, to learn to draw fast and accurate, and to study carefully the effects of changes in light, muscle tone and position, sometimes so dramatically affecting the expression. Suitable sources for additional support are photographs, drawing from memory or from screen. To use life models or not depends much on the circumstances and the goal. As mentioned above, to display a defined body position or gesture requires eventually considerable physical skills and mental insight and are in general best presented by people intimately familiar with. Due to their mental differences e.g. a ballet-dancer, a fashion-model or a person experienced in physical meditation may present a similar body-position quite differently, in spite of well matching physical resemblance. If a project is already well defined, a single model will rarely fulfill the anatomical and mental requests and to proceed without may eventually present the best solution. If the purpose is to study the interaction of a specific person with a specific surrounding, a life model is obviously a request. To work with life models involves also aspects of personal interaction. To draw or paint a portrait or a body where physical resemblance is the rather only request should not cause any problems. If the idea of the character to be presented is however already well established in ones mind, the fact that the model may fit physically but not mentally may cause considerable irritation. Also a model may not like the way it is presented. It appears wise to address theses questions before starting any sessions, and to agree on proceedings, which make sense to the artist and the model as well. The shape of the body is primarily determined genetically but modified importantly by the daily activities, age, diseases and mood, processes and conditions in lifelong interaction. The size relationships of the bony and muscular body parts vary importantly within as well as in-between individuals. E.g. in athletes and people with excess amounts of fat tissue, the neck can easily present larger than the head. In some athletes the shoulders are voluminous, high positioned and far apart, but in others rather close together and lack of any distinct characteristic. Some males and females have very slender necks in spite of being very sportive. To have especially a close look at the size relationship of head, neck, shoulder, arm and hands is of relevance for portraying, as they all take part - even in an very indirect way - in shaping the facial expression. Not a topic of this outlay but closely related to are dynamic aspects of the expression or presentation, as they appear e.g. impressively in a slow motion reply of a finish of a 100 meter race. Before starting any life sessions, it is wise to ask the model to perform a few steps, to move the head, the arms and the shoulders, hold the hands before the face etc., to become aware of the size relationships of the different body parts and to gain insight in the dynamics of their presentation, eventual useful for implementation in the art-work itself. Bones, muscles and their tendons, subcutaneous fat tissue, skin and skin folds are most responsible for the visual perception of the tectonic and shape of the human body. Bones and articulations determine the kind and the extent of the movements. Restriction occur by the articulations themselves, the ligaments or by soft tissue. Most gestures involve movements in several articulations. Forward-bending of the trunk involves the lumbar part of the vertebral column as well as the articulation in-between the pelvis and the femur, lifting of the arm involves not only the articulation in-between the humerus and the scapula but frequently also implies a rotation of the scapula, to name but two. To make a muscle visible requests eventually considerable ability. Many of such maneuvers or positions cannot be executed or maintained for a prolonged period of time, thus requesting documentation supported by photography or reconstruction from memory and anatomical knowledge. A defined body positions can be achieved by activating very different sets of muscles. Important muscles involved may not be visible at all, such as the rhomboid or ilio-psoas muscle in lifting of the shoulder or the leg respectively. Deep laying muscles may importantly affect the visual appearance of the body surface, making eventually a correct anatomical interpretation difficult. Further modifiers are the subcutaneous fat tissue, skin folds and the skin itself. At certain locations such as the vertebrae, the acromion, the olecranon, the iliac crest, the patella - to name rather important ones - the skin always remains close to the underlying bone, allowing these parts to serve as points of repair. The subcutaneous fat tissue and skin folds can importantly obscure the underlying anatomy. Of mayor importance in the determination of the body shape are further the state of pulmonary inflation - variable in-between 2 to 6 liters -, the amount of intra-abdominal fat tissue, and the way the muscle of the abdomen shape the abdominal cavity. And finally attention has to be devoted to the various accessory organs and structures of the skin, such as the different type of hairs and the areas of very variable size they cover, vascular structures such as the veins, muscular tissue such as the platysma of the neck or smooth muscle elements becoming eventually evident under emotional stress. Much of the appearance of the skin relates to the effect of glands, color and pigmentation. Occasionally shadows or other conditions suggest a very different anatomy than the in reality underlying one. This situations are discussed in context with their occurrence (Marked as “!!!”). Note : To differentiate in-between a vein and other structures such a as a tendon or a border of a muscle, is best done a tipping onto it with a finger. Veins collapse and refill, muscles and tendons remain firm. (Loyola University Chicago, Stritch School of Medicine. Michael F. Dauzvardis, Ph.D., John A. McNulty, Ph.D., Baltazar Espiritu, M.D. David Lee, Susan Sadowski, Greg Klitz, Manzi Yuan.